For several years prior to 1970, many people in Rivers had been working towards establishing a library here. When it was learned that the River Air Base was to close it was realized that there was a well-equipped library existing there and books could probably be obtained to be kept locally. A group of people were called together and a Library Action Group was organized. There were so many people involved in the project in the next while it is now difficult to recall them all. Although, three names come to mind; Mrs. Anne Harris, Mrs. Hazel Oakey, and B.J.D. Ellis. 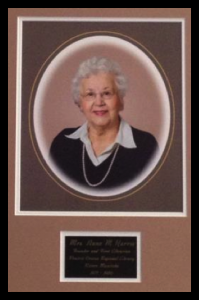 Mrs. Anne Harris was an original member of the Library Action Group and continued to always be there, directing the work that had to be done. Others came when they could bust she was always there. By the spring of 1971 the library was operating. No salaries were paid for any of the work, and Anne worked as a volunteer for two years because of her keen interest in the project. Anne continued as the Head Librarian until her retirement in 1986. In 1975 a Regional Library was formed to extend services to the R. M. of Daly and the Town of Birtle. Birtle separated in 1977. A contest was held to name the new library and the name Prairie Crocus Regional Library was chosen. Lifetime residents of the area remember several large tracts of original prairie sod within a mile or so of the Town of Rivers, that became a solid field of mauve crocuses in the spring. It was an appropriate name to help the people of Rivers and the R.M. of Daly remember this part of their history. Prairie Crocus Regional Library continues to offer its patrons a wide range of library and cultural services. After a very positive financial response from local businesses and individuals, automation of the collection began in 1996, and by October of 1997, the computerized system was up and running. A new circulation area was installed in September of 1998, providing public access to the Internet. 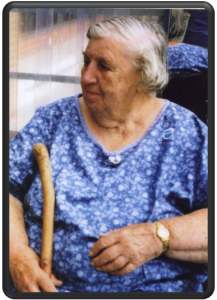 Another very prominent person in the history of the Library was Mrs. Hazel Oakey. Mrs. Oakey was on the Library Board until 1997. She was Chairperson of the Board at one time and was the Treasurer for almost 20 years. “It was about that time that the Airport closed that we got the library. Several interested people met together to discuss the project. Mr. Ellis wrote to the Dept. of Defense to ask if we could have the books from the library at the base when they closed. They agreed. We had to go out and put them in to boxes. They just gave us adult books. In a few days they brought them all in to Rivers with a quantity of shelving and put all in the room to the east of the entrance door at the civic center. We had no authority to have a library. The town hadn’t voted on it, and we had no money. Anyway we set about getting order out of chaos. We had cake sales and so on to get a little money. Anne and Darrel Harris were great help and Anne became our first librarian. Joyce was on the library board at the beginning but when she moved to Yorkton, I was put on in her place. I was on the board until 1997. I was chairman at one time and was the treasurer for almost 20 years. Daly was approached the next year and a vote was held. Anne Pettapiece spent a good deal of time traveling around the west part of the municipality asking people to vote for the library. The people were in favor and voted yes. We were joined the first few years by Birtle but there was friction and I made a motion to separate. From then to now it has just been Rivers and Daly. NOTE: downloads have limited usage control, parental monitoring is recommended. Contact the Library for more information.